Relocating you, your family, and all your possessions isn’t a simple process unless you can stuff everything you own into a single duffle bag. For the other 99.99% of us, moving is going to take some planning, preparation, and a lot of sweaty labor. 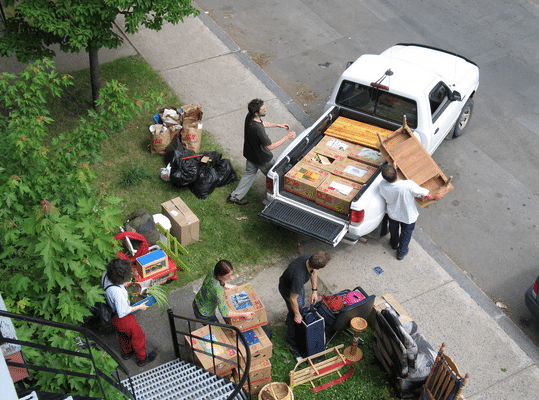 You probably already know some of the basics for making your move run more smoothly (labelling boxes, packing like items with like, and so on). Here are a few tricks you might not have thought of that will get you out of the old house and into the new one more quickly and less painfully. Stretch wrap comes on a roll and is a plastic that looks like the plastic wrap you use in your kitchen but is wider and far stronger. You can use this stuff to wrap up all kinds of things and to protect furniture from dust and dirt during the move. Another great use for stretch wrap is on hanging clothes. Simply squish a bunch of your hanging wardrobe together on the hanger rod and then start wrapping it up in a bundle. You can also slide a plastic garbage bag around the bundle to help contain it and then finish the job with the stretch wrap. This way, your clothes are ready to hang the minute you arrive at your new place but are protected from dirt and smudges during the journey. If you’ve got friends and family helping you move into your new digs, you’re lucky. Make things very easy for them (and yourself) by hanging identification signs in each of your new rooms so that your helpers know exactly where each box needs to end up (Living Room, Dining Room, Johnny’s Bedroom, etc.). You can get even more specific and label where in each room the large pieces of furniture need to go. Design and print labels on your computer before you move or buy some poster board and a marker to do the job when you get to where you’re going. Don’t forget the tape! Moves are difficult for children, so do everything you can to help them make an easier transition by getting their stuff out first. When it comes to packing the moving truck or storage unit, plan to have it so that the kids’ boxes and furniture comes off the truck and into their new rooms before anything else. While you and your helpers get everything else into the house, children who are old enough to do so can start opening their boxes and organizing their rooms the way they like them (obviously, small children will need your help). They’ll hopefully feel more at ease as they settle into their new home if they are surrounded by familiar possessions. Stop! Before you start unplugging cords and wrapping up game consuls, televisions, computers, and sound systems, take some pictures. Whether or not you were the one who set up all your electronics, it will certainly save you time and frustration to have a good photo to refer to as you put everything back together. If you’re not good with electronic setups, you’ll thank yourself multiple times after you move in to your new home. Hopefully these moving hacks will make the whole process smoother and less painful. One more moving hack is to have a storage unit ready to receive your packed belongings as you get them out of the house and before you take them on their final trip to your new home. Value Store It is the first place you should look to find high quality, secure storage units in a variety of sizes. Visit our home to find the location and the storage unit that is right for you.